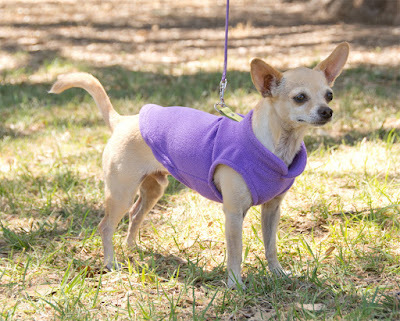 The Gooby Fleece Vest is the perfect lightweight solution for active tiny dogs that need to stay warm in mild winters. It has a leash ring on the back, so you don't have to worry about layering a harness over or under a jacket. The vest is breathable, and moves with your dog. It is available in sixteen different colors, and five sizes to fit dogs with chests 8.5-20" around. During the dog boutique fad of the 2000's, I considered Gooby to be a high-end brand. Their little Freedom harnesses were ridiculously expensive, and they sold adorable little dog sneakers that were considered pricey compared to MuttLucks. Since then, Gooby has gone downhill in my esteem, they're now a big box store brand rather than an upscale boutique trend. Also their quality appears to have tanked. My Gooby Epiks literally fell apart while stored in a drawer in a climate-controlled house after being worn twice. I tried contacting the company and never got any response. At any rate, Gooby does make affordable dog clothes cut to fit moderate body types. Ru can wear both the small and the medium versions of this vest. I like putting it on him for hikes because he doesn't have to wear a harness, and the material doesn't pick up stickers or bits of grass. Pros: Not designed for short-backed, wide dogs. Breathable, stretchy, and sporty. Durable. Doubles as a harness for wimpy dogs. Cons: Doesn't come in larger sizes, though these would definitely need to omit the leash ring. Bottom Line: I'm no longer in love with the company, but they still make decent dog clothes. I use this fleece vest a lot.